Like all good things, video games are better when they’re shared. Sure, there’s a lot of joy to be had grinding away at an hours-long campaign in an immersive RPG, but the best multiplayer games bring a sense of camaraderie to proceedings, and also, if it’s kids you’re dealing with, gets them to play together and be reasonably quiet for a bit. Success! Not sure where to start your shopping? We’ve put together a list of the best Xbox One multiplayer games to get you started. What about our guide to the best Xbox One accessories? In many ways, Fortnite Battle Royale is the ultimate multiplayer game. It’s fast-paced, expansive, and totally collaborative, a live battle royale that sees you compete for survival with 99 other players from across the world in real time, squad by your side or as a lone wolf, whatever you prefer. And the community spirit doesn’t end there: if you have an Xbox Live Gold subscription, it’s totally free to play. Much more vibrant and chaotic than many straightforward military sims, and with a combination of endless building and combat options twinned with simple, easy-to-learn systems, it’s in a class all its own. We can’t even begin to think about how many rifts FIFA has caused since its launch in 1993, so when a friendlier-feeling alternative comes along, we’re all for it. 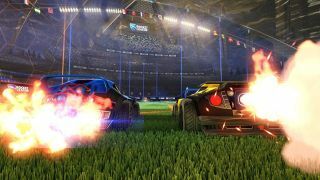 Rocket League is a football game, but with rocket-powered cars, and yes, it’s exactly as awesome as it sounds. A high-energy multiplayer suitable for ages three and up – you can play offline against a fairly challenging AI or in 36-week season mode too – it sees teams of rocket-powered cars pull flips, turns and barrel rolls to get their goal in a fast-paced display of impossible physics, adding in customisable elements and alternate modes that give players of all ages something to enjoy again and again. From a kid-friendly multiplayer to one that’s… well, decidedly un-kid-friendly. Even if you’ve never played Grand Theft Auto before, you’re doubtless aware of its slightly seedy but superbly satirical gist, and Grand Theft Auto V is easily the best of the lot. Its unique multiplayer is no exception, an online mode that lets you team up with friends or automatically match with players of a similar level of skill to engage in some (to put it mildly) mischief. Take part in heists, races (car, aeroplane, or helicopter), deathmatches and even the odd arm wrestle – planned to a T or on the fly, whatever you’re in the mood for, you can make it happen. Long-time Halo players and Master Chief have been through a lot together, and now you can play through the whole saga, complete with beautiful remastered graphics, start to finish. Of course, you can bash through the four games solo, but arguably this collection’s main charms lie in its multiplayer prowess. Enjoy near-endless co-ops with a choice of every single map ever featured in the original titles, including six remastered Halo 2 maps: that’s over 100 multiplayer and Spartan Ops maps to choose from, so you’d better round up some supersoldiers and get started. Giant mecha robots and dimension-jumping? In space? We’re sold. Titanfall’s impossibly smooth and responsive gameplay mechanics are already the stuff of legend, so apply that to a much-improved multiplayer aspect (as compared to the original Titanfall) and you have one of the most satisfying co-op experiences in an FPS. There are several distinct multiplayer modes to choose from in Titanfall 2, some familiar and some brand new, from basic team deathmatches to the exciting Bounty Hunt, which sees you earn money for kills and rush to deposit it before you’re dispatched. Throw in title-specific elements like powerful Titans and the ability to jump realities to avoid damage, and you have a unique playing experience indeed. Battlefield’s overall impression, whether in solo or multiplayer mode, is one of genre-defining brilliance, with incomparable sound and level design that only enhances the grim realism of life in the trenches. With six multiplayer modes, you can choose whether you’re in the mood for attack waves, team deathmatches, ground-gaining operations or, erm, War Pigeons, a capture the flag-style that sees you capture, hold and release randomly generated carrier pigeons. Aptly for a war game, these modes really are all about teamwork, so make sure to lead your squad and consider your tactics carefully. It’s generally accepted that Forza Horizon 3 has some of the best maps of any racing game, encouraging exploration of vast landscapes as much as it does tearing up the tarmac. But a great deal of the fun is still to be found on the track, as its multiplayer mode proves. You’re given total control over your events, including the option to hire your friends to star in your festival (and then fire them when they underperform), and the online multiplayer racing and 12-player free roam is superb. Best of all though, you can now share the Horizon campaign with up to three friends in the all new co-op mode.